Rotisserie Chicken, the quick grab and go in all the supermarkets nowadays. I admit I don’t know how we existed before the arrival of the popular commodity. Rotisserie chicken makes just about every recipe that calls for chicken so much easier. It is definitely a time saver. It is my go-to whenever I make chicken salad and my go-to when we need a quick meal. I love the fact that for each rotisserie chicken I buy, we can get two meals and I also get a nice container of rich carcass stock for my freezer. That’s a big win in my book and my pocketbook. Leftover rotisserie chicken makes the next day’s meal easy, too. It is like a gift that keeps on giving! A great way to stretch the leftover chicken is to turn it into a filling pasta dish. As I could eat pasta just about everyday, my hubby is much more of a conscious eater than I am, so I usually have to “sell” a pasta dish to him. This one I only had to “sell once before becoming his favorite, “Look at all the fresh greens in this pasta. 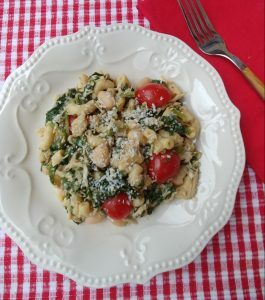 Do you know how much protein is in beans and how good they are for you?” All of that is true in this quick and easy Tuscan Rotisserie Chicken Pasta-it is full of greens, tomatoes, beans, and flavor. 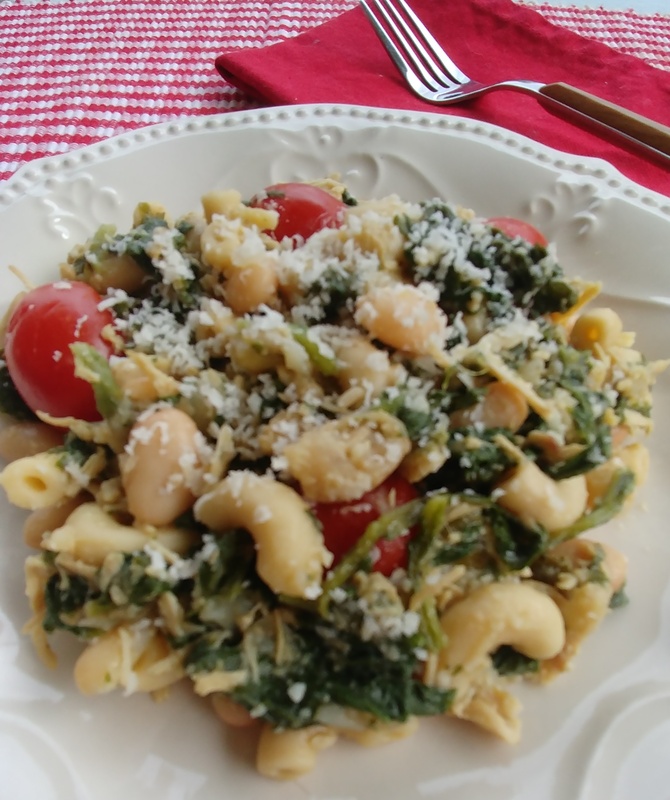 Bonus for you if you have leftover white beans to use, too! Heat 2 TBSP of olive oil in a large skillet over medium heat and add onion. Sauté for 3 minutes. Add the chicken broth, garlic, and Italian seasoning. Simmer for 2 minutes. Add the fresh greens, chicken, and beans. Simmer for 10 minutes. Stirring occasionally. Stir in the tomatoes, last TBSP of olive oil, and pasta. Cover. Turn off heat. Let stand 5 minutes. Put on Your TO COOK IS TO CREATE Thinking Cap: No chicken broth? Use vegetable broth or for a heavier pasta? Add cream. No white beans? Add chickpeas or navy beans. Have sundried tomatoes? Add them instead of cherry tomatoes. Not a big fresh green fan? What other vegetables would be good? Carrots? Artichokes? Eggplant? Zucchini? Roasted red peppers. Have fresh basil? Add it. No leftover rotisserie chicken? Use flaked tuna and add in the end with the tomatoes. Not in the mood for pasta? Serve over rice or increase broth amount and serve as a soup with some crusty bread for dipping. 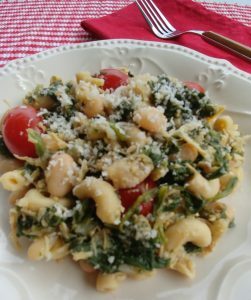 Wanting another healthy pasta option? Try the no cream and no butter Quick Vegetable Pasta Primavera. FOOD FUN: According to many sources on the web, the average American eats 19.8 pounds of pasta a year. (Minus my hubby, but I eat his share, so it works.) The World Record for pasta eating is 10 pounds in 8 minutes. Something to think about when eating your next big bowl of pasta! That sounds so good! I love pasta but I never cook it. In fact, I never cook anything! I do make my own breakfast when I can’t go to the restaurant.